“Can I see the complete overview of all touch points with a customer on 1 screen”? These are the three of the most common heard questions in a lot of CRM projects. SAP Sales Cloud already provides a lot of insight out of the box, also on your mobile devices, however showing information related to (potential) sales, targets and sales last year directly on the account itself is not something provided in the standard. Imagine that you are a sales representative and you are planning to visit your accounts. The ideal situation is that you open your tablet / laptop or mobile phone and directly see the last financial status of the customer in a neat way. Want to bridge that gap for your sales reps in a more sophisticated way? Mainly due to these disadvantages which we come across in our projects we dived deeper in what is possible to fulfil these needs. Besides a Sales Account Dashboard that shows the financial situation a common heard request is to have an Activity Account Dashboard which will show for example the last 5 activities, last 5 visits, last 5 opportunities and the last 5 quotes / orders on 1 screen. The Acorel 360 Account dashboard application provides a fantastic solution for getting a real 360 view of the customer, on both sales performance and historical activities. First there is a need to create Cloud Data Sources that consist all the data that are needed to make the required Account Dashboard. Think of data sources that consist the following information if your dashboard is sales orientated: potential, target, actual sales, last year sales, amount of orders which are provided per account, time-period, sales rep and product categories. 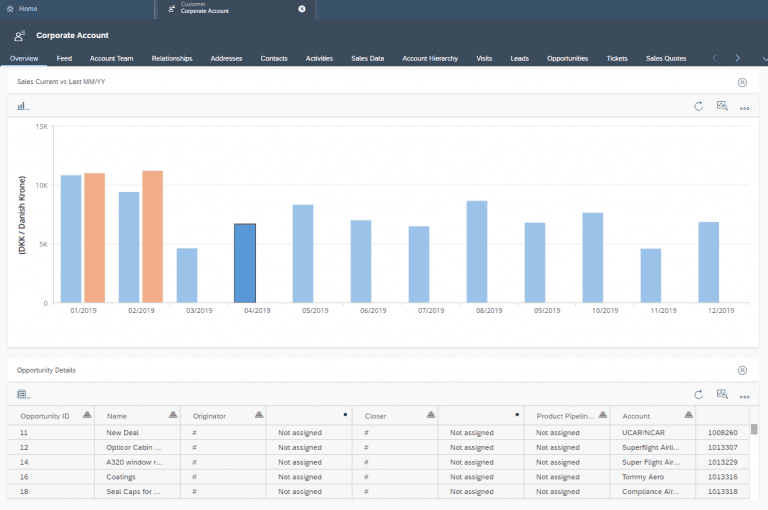 The same data sources can be used for a roll-up dashboard for sales managers. These Cloud Data Sources can be manually loaded every week or month, but preferably this should be automated. Via Webservice calls it is possible to retrieve the data automatically from an external source, ensuring that on every specified time-frame a job runs to collect the latest up-to-date information and enrich the cloud data sources. 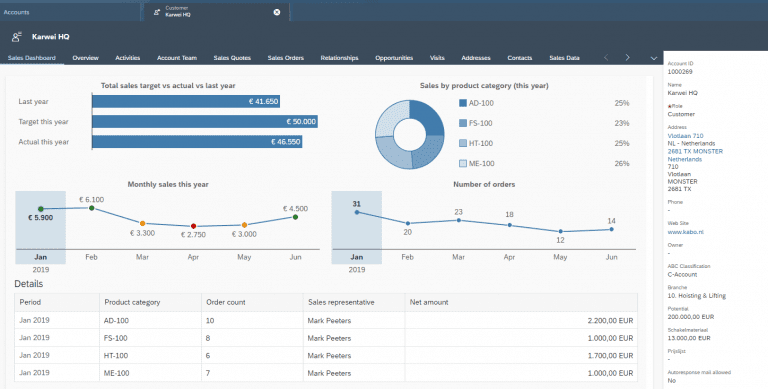 Technically the Sales Dashboard is a custom HTML5 application developed with SAPUI5. The application is running on SAP Cloud Platform. 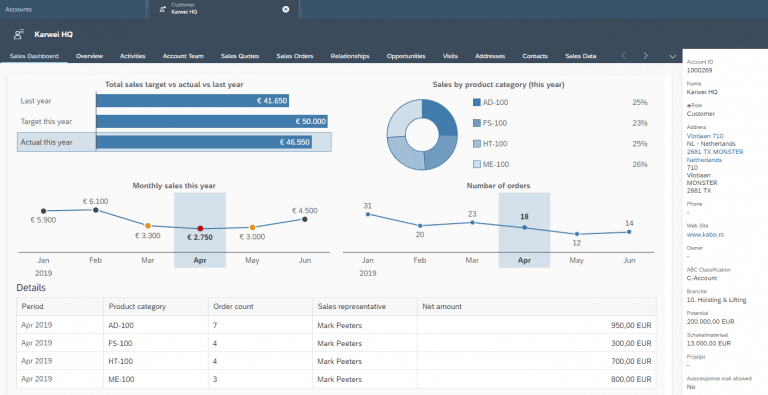 The data is read from cloud data sources in SAP Sales Cloud via OData and presented to the end user in interactive charts. The final application is integrated in SAP Sales Cloud using a HTML Mashup. Detailed data is displayed in a list when the user clicks on one of the interactive charts. This “click-through” functionality is a huge benefit which is not supported in embedded reports nowadays. Compared to solutions that SAP Sales Cloud currently have available in the standard the Acorel Account 360 Dashboard provides cleaner insight, without any scrolling and possibilities to have interactive reports directly linked to the account the sales rep opens. Imagine that your sales rep only needs to go to the Account Sales and Account Activity Dashboard to see all the latest information regarding the customer instead of opening multiple tabs or even opening other systems to get the financial insight, which would really accelerate the time they can spent on the customer itself instead of searching for the correct insights! Acorel 360 Account Dashboard: Changed the Monthly Sales Selection and the new relevant details are available. Interested in more information about the possibilities Acorel can provide regarding the Acorel Account 360 Dashboards? Then contact Acorel for more information!